From the 29th of January Curious Planet will be running a series of theatre performance and design workshops at the Brook Theatre in Chatham in the run up to the production of their new opera: Element – Beyond the Immutable Weight of Gravity. 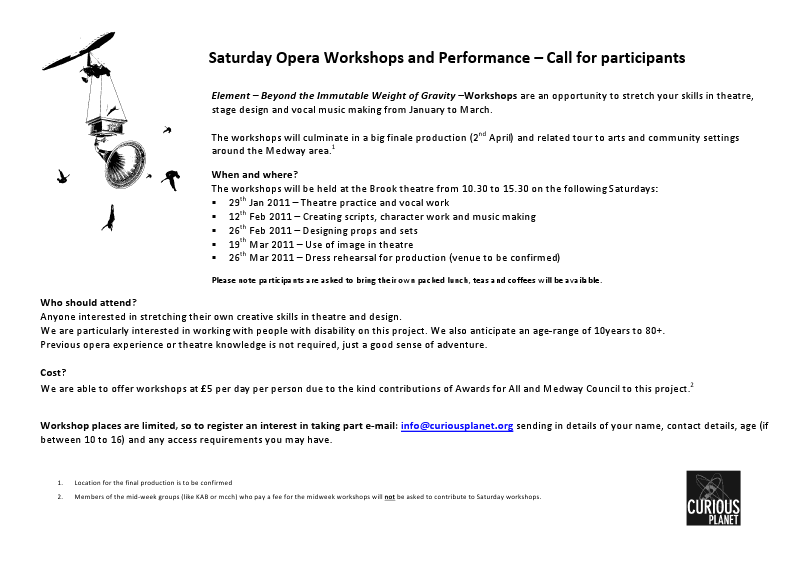 Each workshop will present participants with the opportunity to acquire and stretch a different set of theatrical skills. Working with professional theatre producers, directors and performers, participants will practice a number of disciplines including ensemble theatre, vocal technique, design for stage, character work etc. Workshops will run on selected Saturdays until March and are open to anyone from 10 years to 100 years. As a result of subsidy funding they are able to offer the workshops at £5 per person per session. Please note that spaces at the workshops are limited and will be allocated on a first come first served basis. *The tour is subject to final funding. Participants of the workshops will be invited to take part in the final production, but will need to attend at least 4 workshops. This entry was posted on 08/01/2011 by Creatabot in Creative Opportunities and tagged art, Brook, chatham, creatabot, creative, curious planet, Kent, Medway, Opera, Theatre.